Alibaba has been trying to propel China’s love affair with online shopping into virtual reality, and now they’re enlisted one of Asia’s top VR hardware makers to help them do it. HTC, the Taiwan-based device maker, announced a strategic partnership with Alibaba’s cloud division, Alibaba Cloud, yesterday. Under the partnership, the companies will work on building a VR cloud ecosystem. “The companies will focus on developing breakthrough innovative solutions to tackle bandwidth allocation, data transmission and data processing needs in areas such as VR video production and VR broadcasting,” said HTC in a statement. HTC has been working in partnership with Valve to develop room-scale virtual reality products, which include hand-held devices and motion-sensor tracking. Alibaba debuted their latest foray into virtual reality e-commerce recently at the offline shopping event Taobao Maker Festival. During a trial run of their ‘Buy+ ” program, users perused items in 72 shops using VR headsets stationed at the event. Both HTC Vive and Samsung Gear headsets were used during the event. Alibaba also has a vested interest in sealing VR partnerships for their entertainment business. Alibaba Pictures, the company’s entertainment unit, has been aggressively expanding into new film and cinema projects, while Youku Tudou, the online video streaming service fully acquired by Alibaba earlier this year, has also revealed plans to produce 360-degree content. The company launched their own in-house VR research lab in March. At the time, they claimed to have already completed 3D modeling for “hundreds” of products in cooperation with Youku Tudou, Alibaba Pictures and Alibaba Music. 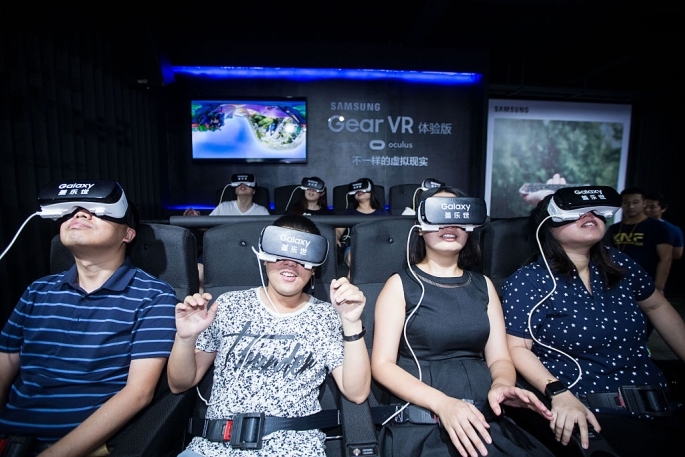 Customers at Alibaba’s Taobao Maker Festival last week testing out the Buy+ program using Samsung Gear VR. Update: This story was updated to reflect the fact that Alibaba used both HTC Vive and Samsung Gear headsets during the Taobao Maker Festival. Correction (8/10/2016 23:14): This story was updated to correct a mistake. Alibaba’s cloud computing division is called Alibaba Cloud, not Aliyun.